This week has been a bit of an emotional roller coaster. So many things going on! First, I got good news at work. Really good news, like news I’ve been waiting for kind of good news. Yet, with good news come more thinking. Thinking about my future. While I contemplate that one, let me tell you about my recent rice pudding adventure. Like in life, I only had so much to work with. 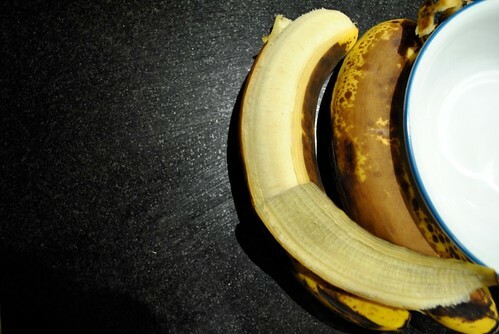 I had two very ripe bananas I absolutely needed to use right now. I could make banana bread or some sort of cookie, but I felt like doing something a little different. I thought about it, and I thought, why not make rice pudding? So, I looked on the internet to figure out how rice pudding is generally made. Breaking it down, it seems that there are multiple types of rice pudding. 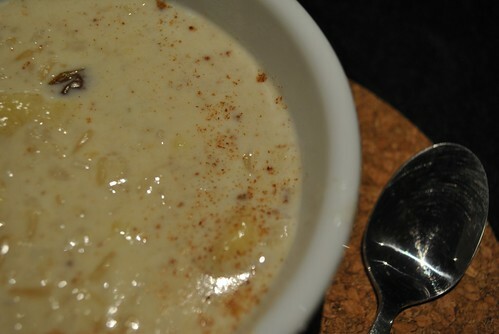 The classic type where it is pudding with rice mixed in, the not so classic type where it is cooked down milk mixed with rice, then there is Indian pudding and arroz con leche. 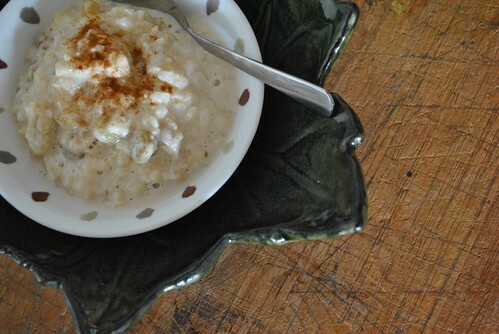 Essentially, rice pudding is rice cooked in a creamy liquid until it produces a thick mixture, like congee (which is like a savory rice pudding, I guess). So, I surveyed the pantry. I had a can of evaporated milk, maybe a cup of skim milk left, some golden raisins, brown rice and cinnamon available. Good enough. First, I cooked my rice. For whatever reason, I thought the ratio was 4 cups water, 1 cup rice. So in 4 cups of water, I put in 1 cup of rinsed rice and brought to a boil before I let it simmer for 40 minutes. 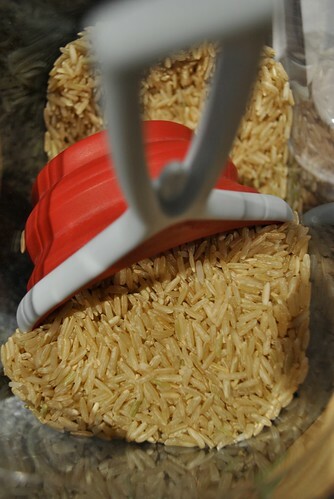 My initial intention was to cook the rice until it was just about done, and let it finish cooking in the milk mixture. But, I was on the phone during this 40 minutes talking to S about some Westchester Breakfast Club business (a partnership with the local paper in the works! ), so I wasn’t able keep an eye on it too well. Anyway, 40 minutes later, I had very fluffy fully cooked rice. Oops. 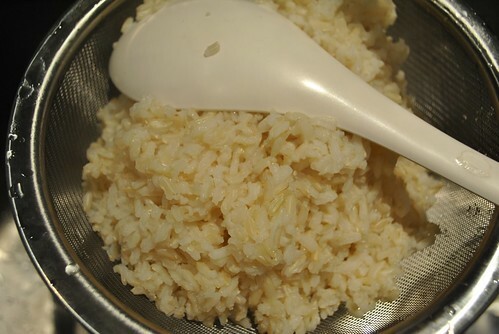 I drained the rice, and in that pan, I poured in a can of evaporated milk, the rest of my skim milk and a very nice big dollop of sweetened condensed milk. I heated it up until it was hot and starting to get steamy, but not boiling. Then, I mixed in the rice, two mashed bananas and an good handful of golden raisins. I also mixed in the cinnamon and gave everything a good stir. Heated it up until it was hot and steamy again, then turned off the flame. At this point it was very liquidy. 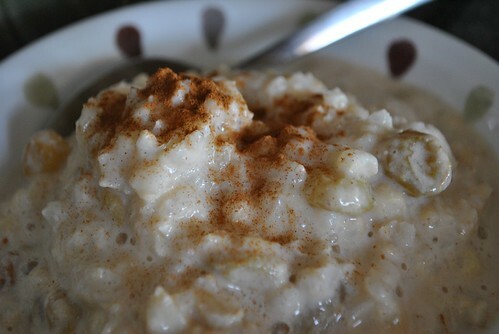 Nothing like pudding at all, but definitely more arroz con leche-esq. So I scooped out a bowl and enjoyed the warm yumminess. I let the rest cool a bit before I put it in the fridge. Over the next couple of days, the mixture thickened up and came to resembled rice pudding more. It was even better eaten cold. The banana flavor really came through, and the milk mixture wasn’t overly creamy or sweet. The golden raisins gave it a nice sweet kick. So, what’s the lesson here? From a vision, I was able to take what I had on hand and end up with something delicious with the help of experience, intuition and adventure. A little like real life right? I sure hope so! This entry was posted in Dessert and tagged Banana, brown rice, evaporated milk, future, pudding. Bookmark the permalink. First of all, congrats on your mysterious good news. Secondly, congrats on the not so mysterious potential WBC paper news! Also, this pudding sounds divine. Way to MacGuyver the crap out of a fantastic recipe! Also, as you know, I love your blog and want to help share it with others, so I’ve nominated you for a Versatile Blogger award!